Dinner on Good Friday was accompanied with a bottle of A F Gros Vosne Romanee “Aux Reas” 2009 that is by far the best of the three bottles of Vosne Romanee Villages we have had on this tour of Old World wines. 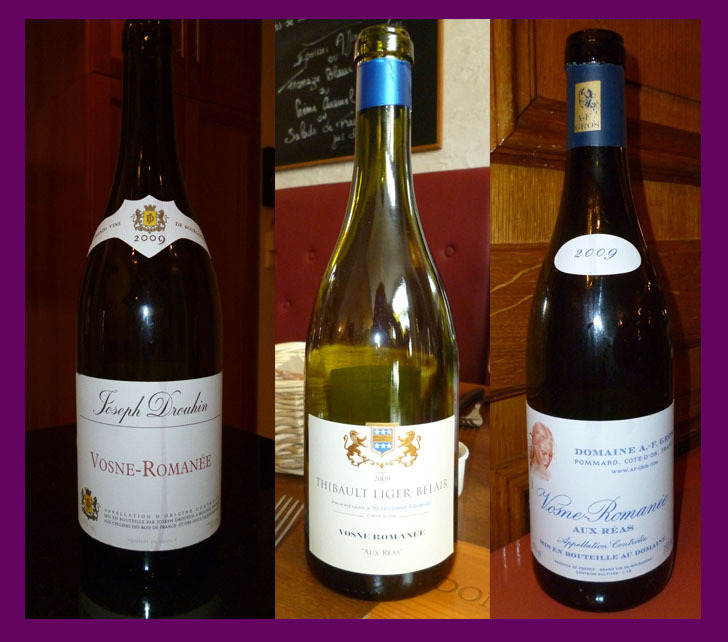 The bottle of Thibault Liger-Belair also from the Aux Reas vineyard was a close second and when we drunk it at Ma Cuisine in Beaune it was the front runner, when compared to the rather rustic Joesph Drouhin we drank at our apartment in Paris the week before. This is my third Vosne Romanee Villages and one has to say this is the best Anne Françoise Gros (not to be confused with Anne Gros or the other two Gros Domaines) is a truly great wine maker. This has the power of the Joseph Drouhin and the subtleness of the Thibault Liger Belair, there is rose petal and violet in amongst the earthy forest floor and dark fruits, ripe cherry on the palate, not what I was expecting and John got Chocolate, which I can’t disagree with and it sure had a long and lovely finish.